If you love the performance, quality, and durability that DeWALT is known for, you’ll love their new line of outdoor power equipment. 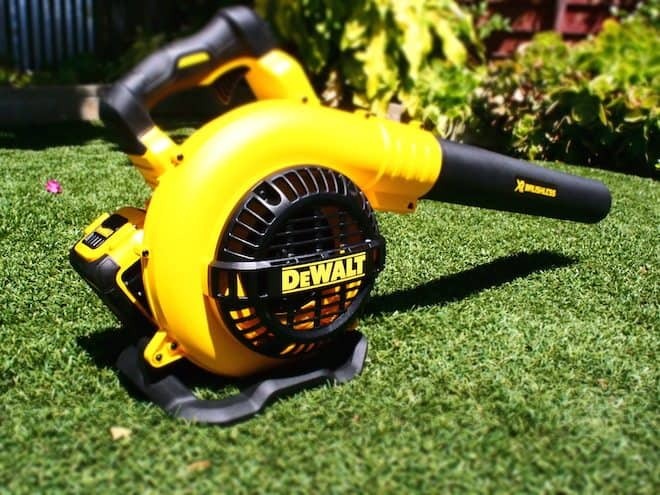 DeWALT has just launched their first battery-powered outdoor power tools which include two 40V MAX Brushless String Trimmers, two 40V MAX Brushless Blowers, and a 40V MAX Hedge Trimmer. We got our hands on all of them can they are AWESOME. The 40V MAX power trumps almost every other cordless platform out there including some of the 80V tools. DeWALT claims that their new tools can replace your gas units and they are right. We wouldn’t hesitate to recommend these tools to professional gardeners and landscapers. The 40V MAX lithium-ion battery platform has their Extreme Runtime (XR) performance, that coupled with the brushless motors is a win-win for you. The handles and grips are contractor grade and you’ll never slip. The plastic molding is very durable and one of our favorite features is how the blower can stand on it’s own instead of laying on it’s side. Those simple design changes are what makes this line stand out. 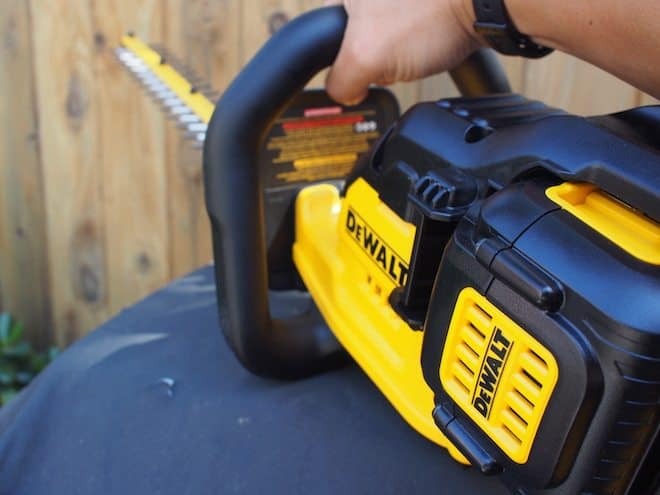 “DEWALT has entered the outdoor equipment category because it can deliver the convenience of cordless with the performance of gas. DEWALT 40V MAX* Cordless Outdoor Tools answer the call for power, runtime, and durability– the same performance expected of all DEWALT tools. 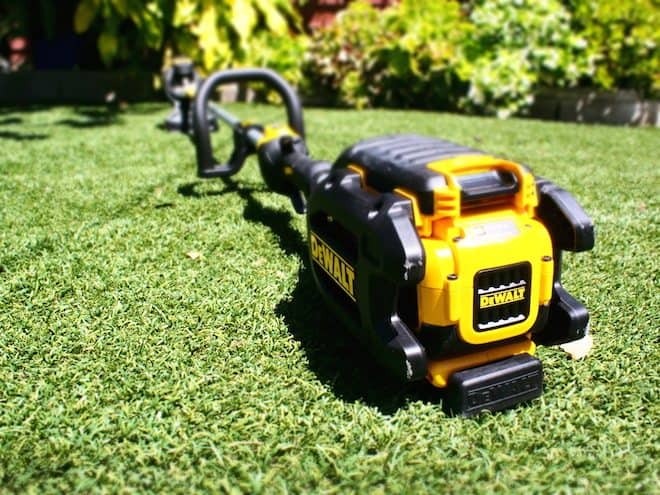 Engineered for lawn care professionals, DEWALT cordless outdoor tools provide a solution for gas-free performance and low noise,” says Eric Prendeville, Vice President of DEWALT Outdoor. The 40V MAX* Brushless String Trimmer comes with either the 4.0Ah Lithium Ion battery or the 6.0Ah Lithium Ion battery for 50% more battery capacity. The String Trimmer features a 15 Inch cut swath, dual-line bump feed head, and a patented gear drive design that provides amplified torque and maintains cut speed under load. A variable speed trigger allows the user maximum control over speed and runtime while a padded auxiliary handle offers comfort for long use. The 40V MAX* Brushless Blower, which also comes with either a 4.0Ah Lithium Ion battery or the 6.0Ah Lithium Ion battery for 50% more battery capacity, features powerful performance of up to 400 CFM of air volume and 120 MPH for fast and effective outdoor cleanup. The Blower also has a variable speed trigger to provide the user full control and a speed lock to allow the user to operate the tool without having to hold the trigger during use. The Blower’s curved tube design creates rotational control which helps to reduce arm fatigue. With an ergonomically optimized handle size and position featuring over-mold, the blower is designed for long use. The 40V MAX* 4.0Ah Hedge Trimmer has a powerful motor equipped with a friction clutch that protects the transmission and provides long-term durability. The 22 Inch laser-cut, hardened steel blades with up to 3/4 Inch cut capacity provide long blade life, lasting sharpness, and precise cuts. A removable gear case cover and top cover allow for easy exchange of blades and access to brushes.Finally, a wrap around auxiliary handle gives the user a comfortable grip in multiple cutting orientations, while a safety lock allows for fast, yet controlled actuation. 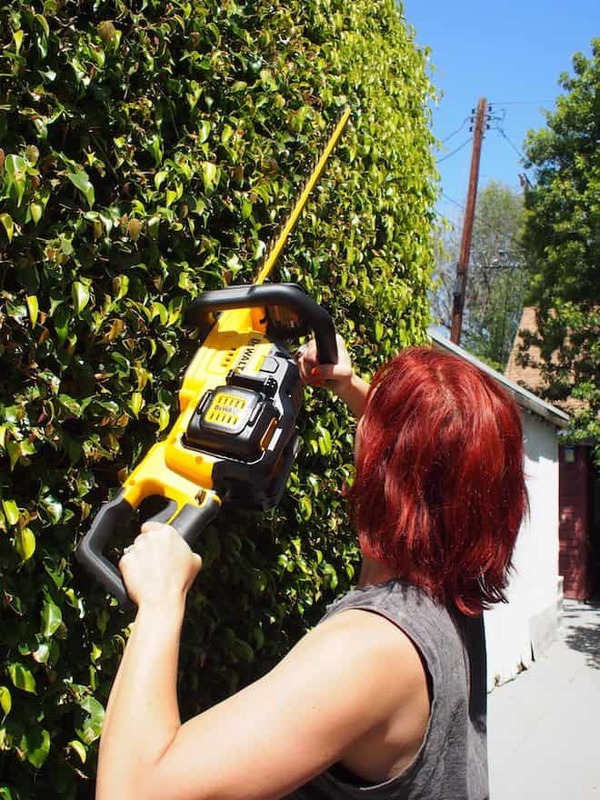 The 40V MAX* Hedge Trimmer can be used with either the 4.0Ah Lithium Ion battery or the 6.0Ah Lithium Ion battery for 50% more battery capacity. No gas means less maintenance, including doing away with carburetors, spark plugs, and air filters as well as costly trips to the pump. It also means no more gas mixing, spilling, or storing required. Battery-powered tools start with just the pull of a trigger, eliminating the hassle of pull cords. DEWALT’s tools include a 40V MAX* 4.0Ah or 6.0Ah Lithium Ion battery and charger. With available back up batteries and a separate 30 minute fast charger coming soon, you’ll never have to run out of gas again. These tools are low noise and therefore ideal for use in noise restricted areas like resorts, golf courses, medical facilities, schools and counties across the country with noise regulations. Built for maximum durability for every day usage, each Outdoor Power Tool features an impact-resistant Xenoy® housing. The String Trimmers and Hedge Trimmer also feature aluminum gear cases while the Blower incorporates a protective roll cage. The DEWALT Outdoor Tools each come standard with a three-year limited warranty, one-year free service contract, and 90-day money-back guarantee. Retail Availability: Available in Lowes, major retailers, commercial distribution, and e-commerce retailers.